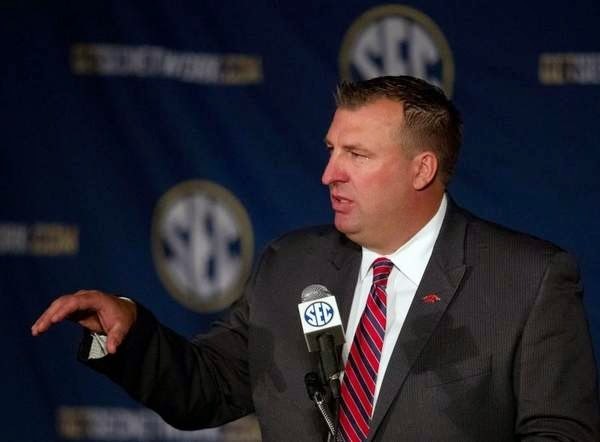 Shirts With Random Triangles: Bret Bielema plans to spread "HOGLOVE" at ESPN "Car Wash."
Bret Bielema plans to spread "HOGLOVE" at ESPN "Car Wash."
Bret Bielema at 2014 SEC Media Days. Via The Shreveport Times. Time for a new feature on SWRT: Things We Wish Bret Bielema Really Hadn't Said. By "we" I mean all of collected humanity, the birds in the air, the creatures of the waters, and the beasts of the ground. (Most notably, in this case, hogs). The Arkansas head coach took time out preparing for ESPN's annual SEC "Car Wash" media blitz in Bristol to send out a tweet to his followers early Tuesday morning. Uh, okay. I really didn't expect to see that one coming, even from an Arkansas coach. One thing I am sure about is that "hoglove" is probably still illegal in Connecticut, and is worth four Fulmer Cup points if caught by the police. Let's just try to forget this Freudian incident and get on, shall we?